Our applications have considerably evolved over the past months. The new version is much more than a multiple-choice form. We have now included a number of new features so that the forms created with our apps raise expectations, and are both amusing and challenging for participants. What new options will you find when setting up the questionnaire, quiz or survey? You can now sort answers by type (A, B, C, D, etc.). This will enable you to show different messages to participants depending on the type of answers have selected. Rate answers and show scores to a single participant and/or to all users. Each participant will be presented with a set of randomly-chosen questions. This way, different questions will be asked to each user. You will find all these options in section 9 of the settings form of a Cool Promo or a Cool Promo White Label. Questionnaire, quiz, and survey templates for your campaign. This is a very simple template, you just need to come up with some questions about your products or services, or about whatever the subject matter you would like to gather user opinion about. You can select the option to include text answers only, so participants can answer freely all the questions you may want to ask. If you want, you can suggest standard answers. This way, survey respondents will just have to choose the answer that best fits with their opinion. Or you can include stars rating from 1 to 10. 2. Quiz with or without points for right answers. In this quiz participants have to give the right answers in order to win. They usually have to choose one or more answers from the options available for each question. You can give points to users for right answers and display the overall score obtained by each participant, or else, publish all the results so everyone can see them. Not all questions need to be weighted equally, as there may be questions which are more difficult than others or which may be more important to win the final prize of the competition. Moreover, you can display a different message to those participants who have successfully answered the questions facing those who have not. This messages can be created in the “Final screen” section. Publishing one or more questions everyday or often until the competition finishes is a good way to keep participants engaged and maintain regular interaction with your followers. In this case, users will have to provide the right answers but they won’t be able to answer them all at once. Instead, users will have to access the quiz regularly to check for new questions. 4. Questions for which the most original answer gets the point. This free-text answer can also be useful to ask open questions that challenge participants’ creativity. The voting option can be enabled for this type of contests, so users can vote for the most original answers. In this case, we will activate the option ‘Make participant answers visible’ in order for everyone to see them. For some campaigns, it can be useful to come up with a test or quiz with random questions. This way, we can select a set of questions and decide how many of them will be asked to each participant. The Cool Promo or Cool Promo White Label application will randomly select the number of questions you wish. This will allow you to create a different participation quiz for each participant in the competition. 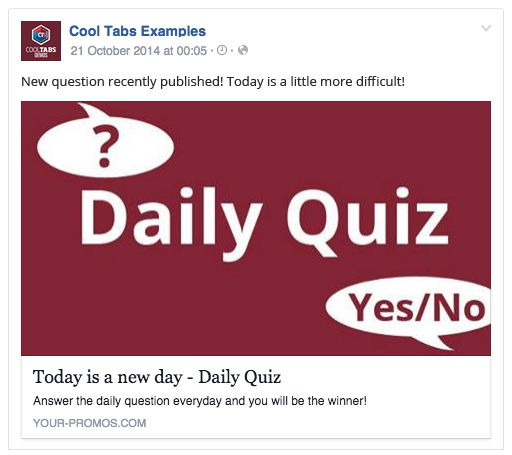 Are you a big fan of quizzes and would like to create one for your followers? This is now possible thanks to the option to group the answers by type. This way, the participants who select mainly type A answers will get a message, those who select type B another one, and so on and so forth. To design a personality test with Cool Tabs, you just need to choose a type for each of the answers you include in the quiz. 7. Quiz with instant solutions. 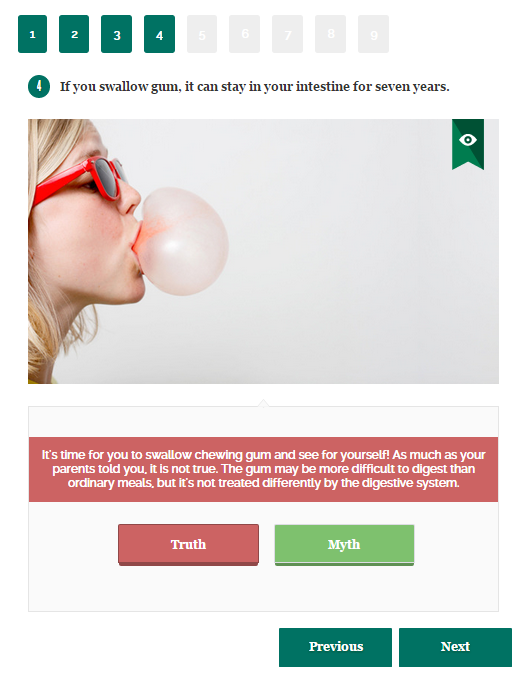 This quiz is very typical for the type of questionnaires with a similar topic to “Choose whether the following statements are true or not”, where users choose whether they think it is true or false and immediately they are told if they have answered correctly or not and why. You can see an example of this type of questionnaire here: Truth or myth? 8. Quiz with a time limit to answer questions. This is even more difficult! If you feel that answering all the questions correctly is not difficult enough, you can also set a time limit to complete the questionnaire. The participants can choose to close the window and try to complete the quiz later, but, once the time limit for answering the questions has expired, it will be useless for them to try to answer the quiz, as this will no longer be possible. You can set a time-limit to complete the quiz in section ‘Campaign periods and winners’ (You must set the time limit in seconds). 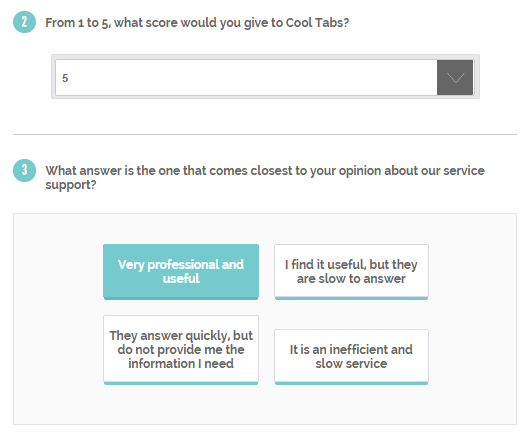 There are the different questionnaire templates you can create with Cool Tabs, but you don’t need to select just one of them, you can pick up the features you like from all of them and then, create your own quiz. Also, if you decide to include it on your website or blog, we provide you two different widgets: One showing the cover of your questionnaire and another that allows you to display the entry form directly. You will only have to indicate the size of the widget, copy the code provided by Cool Tabs and paste it into your website. You can find this widgets in the "Publish" section of your campaign.